It is important to have a Realtor on your side, someone who eases your tensions and helps you understand the buying and selling process. Vivienne's direct and straightforward manner makes sure that nothing is done without careful thought and consideration. Vivienne likes to ensure that her Buyers buy the right home for their needs at the best possible price and that her Sellers get the best possible price for their homes with the least amount of stress and inconvenience. It is this consideration and empathy for her clients that keeps them coming back to her for assistance in buying or selling their homes, and ensures that they refer their relatives, friends and colleagues. Originally from London, England Vivienne has lived in Canada since 1974, and in the Toronto area since 1984. She is the mother of 4 children so she understands what is important to buyers with families and has a natural gift for matching buyers to homes. Vivienne knows that it is not only the home that is important, but also the neighbourhood and its benefits. 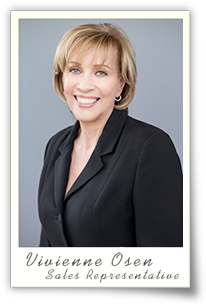 Service has been the foundation from which Vivienne has built a successful career in real estate since 1989. A passion for real estate and people as well as the skill of really listening to what people say makes Vivienne a dedicated and compassionate agent that you can trust to help you enjoy your real estate experience.